Growing up in Sao Paulo I often enjoyed great Middle Eastern food. Thanks in part to the huge inflow of immigrants from Lebanon in the 20’s, paulistas have an abundance of Middle Eastern restaurants to choose from. I was spoiled on kibbe, sfiha, hummus, tabouleh, fattoush, kofta… delicious cuisine! Only after I left Brazil did I realize that those delicacies aren’t available at every corner of the planet. And… I miss them. Whenever I return to Sao Paulo to visit my family it seems like I’m too busy enjoying Brazilian food, mostly home-cooked, to seek out restaurants, so Middle Eastern food gets postponed until “next year.” Because this “next year” pattern has recurred for more than a decade, I decided to take matters into my own hands. I’ve had this recipe since 2000 – from one of my visits to Sao Paulo, when a friend of mine gave it to me, straight from her Lebanese neighbor. It’s hard to accept that it took me a decade to make it, but it’s better late than never, and I’m sure glad that I did! You can make kibbe (or, as we spell in Brazil – quibe) in two basic ways. The first is to shape the meat around the filling as individual portions, with a classical torpedo shape. In this case, the kibbe is fried. The second approach is to bake it in a tray, with the filling in a middle layer. I opted for the latter, which was always my favorite. Soak the bulgur wheat in cold water for 30 minutes and drain well. Add it to the other ingredients of the top and bottom layers and mix very well with your hands, and then set the mixture aside. Prepare the filling by sauteeing the ground beef in olive oil with the other ingredients (except the pine nuts), until cooked through. Drain off the excess fat, mix in the pine nuts and set it aside to cool. 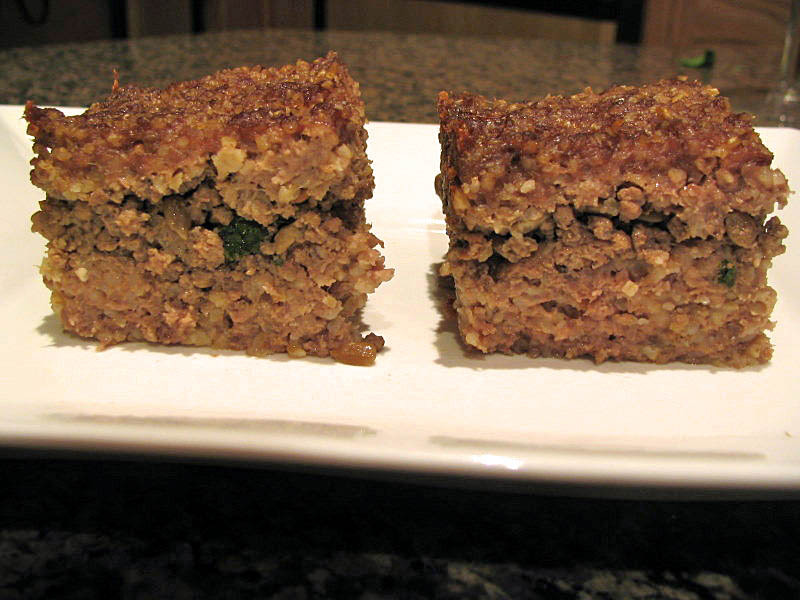 Assemble the kibbe: divide the meat/bulgur mixture in two and spread half on the bottom of a baking dish, forming a layer 1/4 to 1/2 inch thick. Add the cooked meat/pine nuts mixture over this layer, then cover it with the remaining meat/wheat mixture. Cut into squares appropriate for single servings (this step makes it a lot easier to serve later). Place the dish in a 325F oven for 35-45 minutes, depending on the thickness of your kibbe. You can increase the temperature to 400F for the final 5 minutes, or run it under the broiler to brown the top. Allow the kibbe to cool for 10 minutes before serving. Comments – Kibbe is not a light dish; it quickly fills you up as a result of the bulgur wheat, so it calls for a light side dish. 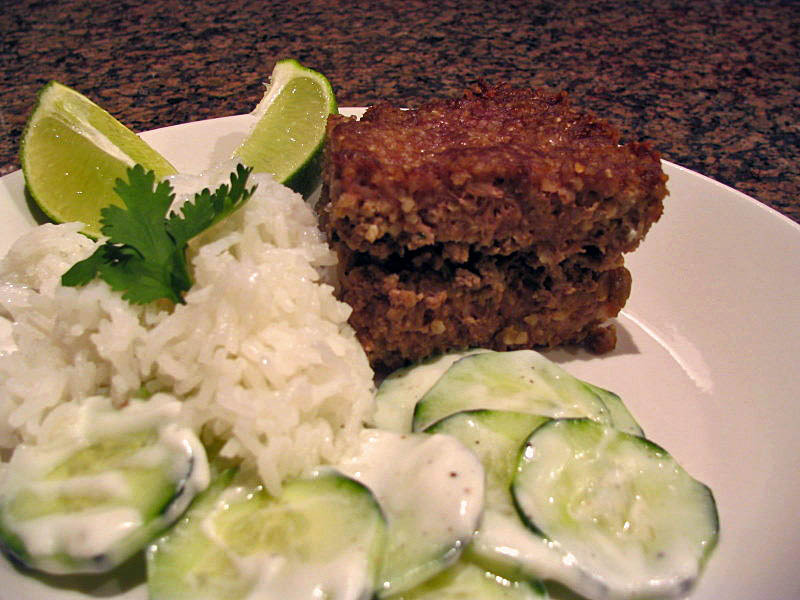 We had it with white rice and cucumber salad with a yogurt-based dressing. 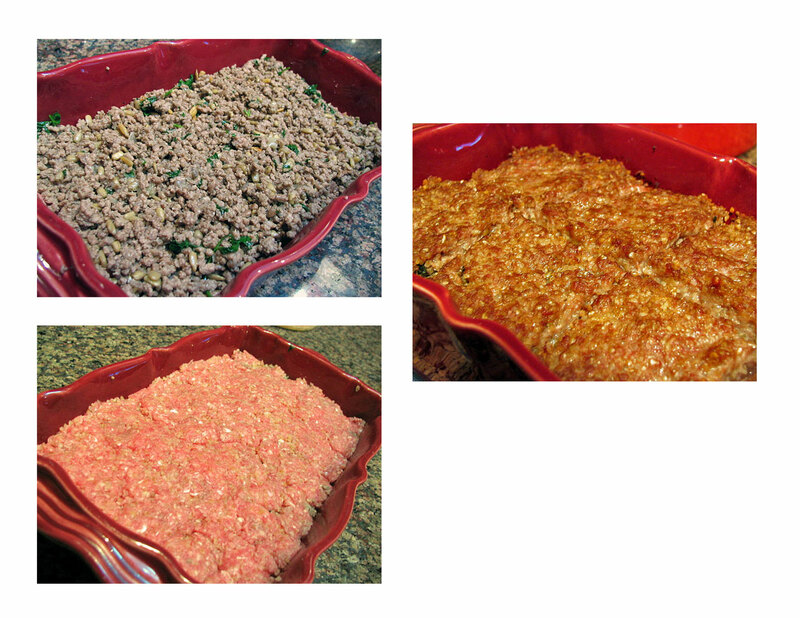 This composite photo (click to enlarge it) shows the addition of the filling (cooked ground beef), the addition of the top layer (raw beef/bulgur), and the kibbe right out of the oven. One simple variation of this dish is to only bake the meat/bulgur, without the middle layer. It’s also quite good, but this version is more traditional and, in my opinion, better. Don’t omit the pine nuts! Their crunchy texture and nutty flavor are essential. We’re making it tonight! Thanks for the wonderful recipe. I am now teaching my 7 yr. old granddaughter how to make this. Thank you for reminding me of all the ingredients. I knew them, but couldn’t remember all the proportions. How wonderful! so glad you found my recipe to be useful and similar to the one of uour past. I am replying with the iPhone due to internet problems so forgive my typos and short reply. Nah, it’s got to be lamb. I have never known a real Lebanese to make it with beef, that is almost sacrilege! lol. I have never used lamb for kibbe (nayee… baked or fried), or for dolmas, or for shawarmas, or for anything! Good Mediterranean food has to be lamb! Also, I was always taught that mint was another main ingredient. 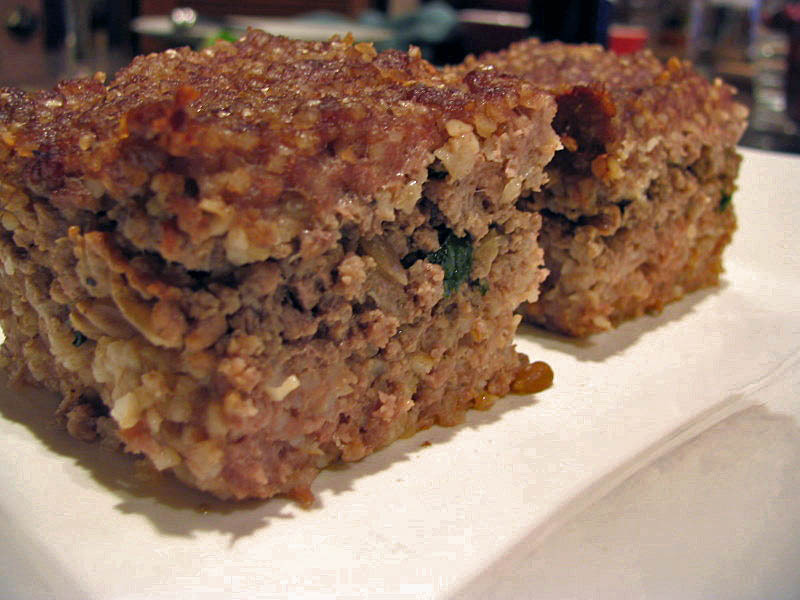 Though maybe things are different down there, this sounds like meatloaf, not Kibbeh. Funny! I actually would have to contact my friend back in Brazil and file a complain! 😉 I suspect, though – that this being around 1984 – ground lamb was probably very hard to find for homecooking. Restaurants would have their sources, but I don’t remember ever seeing it for sale in grocery stores at the time. Now you can find pretty much anything in Sao Paulo. I know it is heretic, but I do use ground beef in place of lamb is some recipes (God forbid, even moussaka… 🙂 because it’s a bit leaner and I have a tough time digesting food that is too fatty, and that is a problem that seems to get worse as the years go by. Sad, isn’t it? I just want to say that my Sito (grandmother) came to the U.S. when she was 20 from Lebanon. And she makes Kibbe (raw and baked) all the time with beef. She does it both ways. My Giddo (grandfather) from Syria, did not like lamb. Which is why she uses beef. It pained me to read “no real Lebanese person would use beef”. That is false. Thank you SO MUCH for your input, really appreciated! No problem! I’m actually going to make these tonight, using your recipe. I’m going to share it with my Sito this Sunday and see what/if she does anything differently. I’ll let you know!